Implant as membership card replacement -any experiences? anybody is using an implant for gym access here? I successfully cloned my milfare classic card to an implant with changeable UID, but the reader in the gym is not able to pick it up, due to limited strength of signal I guess. Public readers are optimized for card sized tags and iam not able to get it work (McFit, Germany). For testing I also put the data in a empty card, that works perfect. Can they add your Chip ID to the system? no use if the scanner is not able to read the tag. you'd need a bigger antenna on your tag. I made an 1:1 copy of my card, so there is no need to change my dataset at the operator. Yes. But there are not Flex iplants with Mifare Classic emulation. The flex formfactor seems to be better readable for door readers. 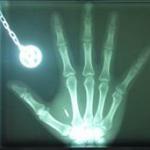 Iam wondering if anybody is able to grant acceess with a small glas implant i a suitable time. With mine it seems to be impossoble. Maybe mine is implanted to deep? How to check it? Not so much a matter of implantation depth but the coupling factor. Those membership card readers basically have the reading antenna area sitting right on top of the transmitter antenna. So they get a really good coupling between the antenna , so they get really strong signals, so they don't need to bother with highly sensitive reader designs. When you have a tiny RFID chip and a huge transmitter antenna coil you only get a fraction of the coupling between the coils, resulting in a very weak signal. Needless to say you need to specifically design the base-station circuit to pick up those tiny signals and properly evaluate it. The actual solution would be to ask your Gym to install way more expensive readers and properly suited antennas. There is not much you can do on the RFID-Tag end other than using a bigger antenna. Thanks for the details. I will examine the reader with an xLED tag to examine, there is any "sweet spot", which may able to deliver enough coupling the read the implant. Sadly many implant seller advertise this function and its somewhat disappointing, that installed readers have such problems with reading it properly. Solution might me a bigger implant, but actually the needed type is not available (xM1 Plus). I suggest sending a pm. Maybe you can get a prototype or help creating demand for a new product.